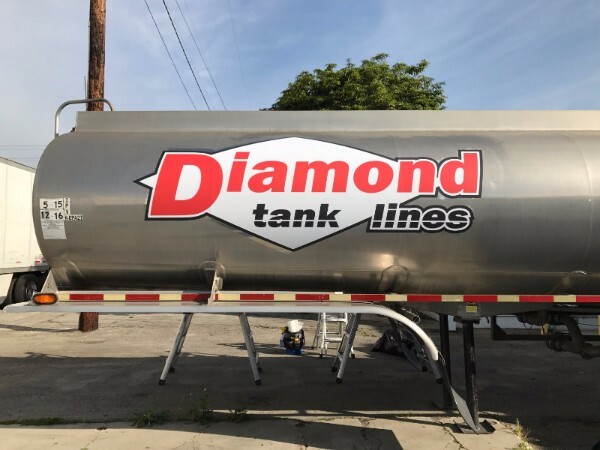 Diamond Tank Lines is a long-established business in the L.A. County area. It features an iconic logo decal on the sides of its silver tanker portions that residents and businesses quickly recognize. But over the course of the years, the useful lives of these stickers ticks down. 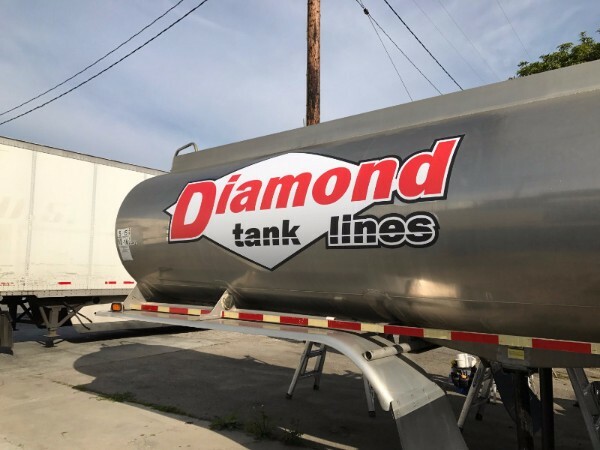 When the business’ management team noticed that some of their tanker trucks no longer provided the desired appearance, a representative contacted our experts to discuss a vinyl graphics installation for tanker trucks in Los Angeles County, CA. Keep you tanker truck decals looking fresh! The decals we were to replace measures five feet in height and nine feet in width. The strong Southern California sun had damaged the products so that some colors were flaking off. Because the logo’s presentation includes a flawlessly designed line that goes through the lower quarter of the object, the flaking of the color led to a visual unbalancing of the decals. We arrived at the job site with our scaffolding in tow. Because it would be easier to replace the decals while the tanker portions were not mounted, it made little sense for the client to bring the vehicles to our yard. The scaffolding ensured that we would install the new decals correctly. Since they are rather large, there would be no do-over, and the first go at the placement would have to be perfect. Could we do it? You bet! We offer expert (and certified) installation! We started by removing the damaged decals and cleaning the areas where we would install the new pieces. After prepping the vehicles, we carefully positioned the new graphics so that they would be straight and in the same location as the items that they replace. Doing so is critical for maintaining the uniform brand presentation of the fleet vehicles. Finally, we put on the new decals and ensured perfect adhesion. The business now once again markets and brands with attractive looking stickers. The useful life of a vehicle graphics product is typically somewhere between five and seven years. The actual length of usefulness depends on a number of added factors. Some business clients can coax more time from their products by taking good care of the vinyl and placing the vehicles in garages when not in use. Others enjoy significantly less time; this typically happens when they follow bad online advice for scrubbing the vinyl clean. That said, damage to plastic could also occur in accidents or because of prolonged heat exposure. In many cases, fixing the problems is as simple as re-printing one graphics panel or decal and simply swapping it out. Do Your Vehicle Graphics Need Updating, Upgrading, or Just Up-keeping? Need vinyl decals for your tanker trucks? 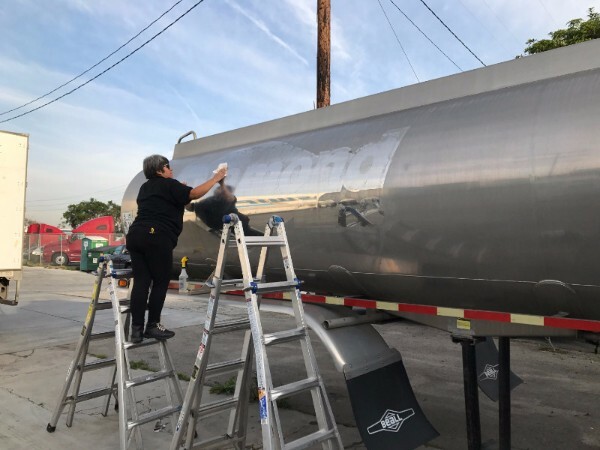 Although you may not need a vinyl graphics installation for tanker trucks in Los Angeles County, CA, your business’ vehicles might benefit from a redo of outdated or damaged decals. Our visual artists routinely assist business clients with the replacement of wrap or graphics panels as well as stickers for a broad range of mobile marketing applications.